28 July 2016广播电台Daniel Loh 访问 (原稿)：美国股市不要追高，新加坡股市可以留意石油股! 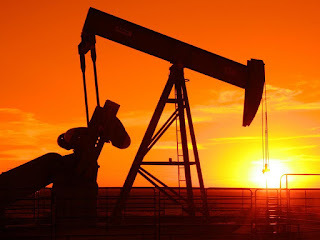 Is it time to buy Crude Oil Stocks now??? Recently Crude Oil indeed corrected strongly as anticipated. A lot of crude oil stocks like Ezion and Ezra dropped drastically. Keppel Corp and Semb Marine looks dead too. A lot of retailers begin to ponder on the situation of crude oil and the oil stocks. 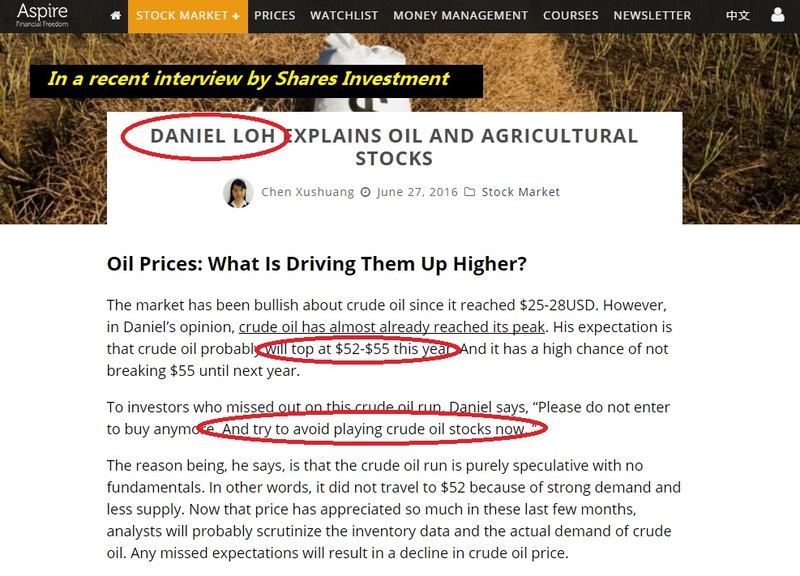 We did mention in an interview in June about our concern when Crude Oil reach a high price of $52. 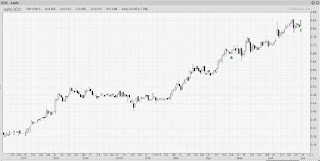 We ask everybody to sell crude oil stocks in the short term as we anticipate the reversal. 2) Avoid Buying Oil stocks when crude oil this year when price reaches the selling zone. But guess what?? Today we think that crude oil may have dropped into the accumulation zone now, which is between $40 - $43. We are looking to accumulate and buy some good oil stocks that have dropped recently! We think that crude oil may have entered our buying zone, and a strong support area, and we are looking to slowly accumulate some oil stocks gradually! Our recommendation is you don't have to sell your oil stocks now. For those who wishes to accumulate, do it gradually by buying a bit to test the water. If indeed it goes up, accumulate again. If you would like us to give a market outlook on what oil stocks to look out for, do come for our free seminar by Andy Yew this week! Topic: What are the Crude Oil Stocks and Singapore stocks to watch out for as STI breaks 2900? 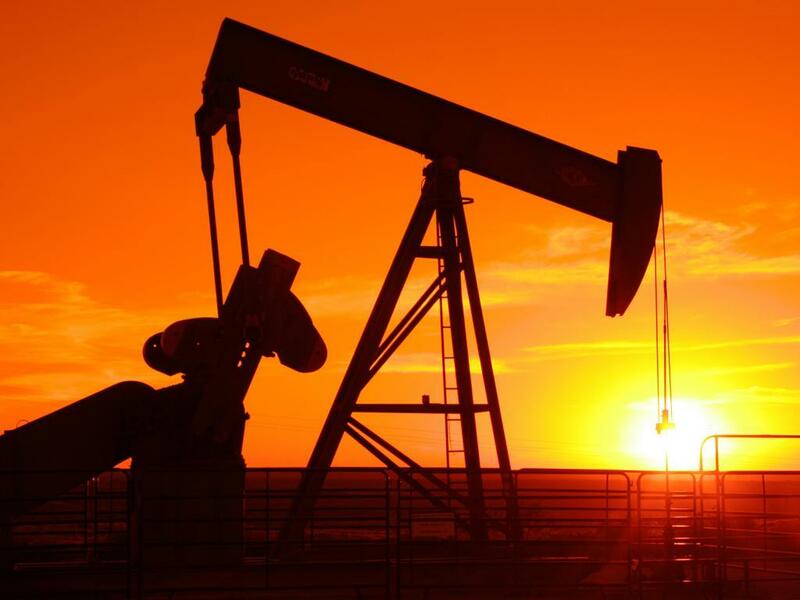 ✔ What are the Strong Crude Oil stocks to watch out for if crude oil rebound? ✔ What is the Best Performing Sector of the month? ✔ What are the Good Singapore Stocks to watch out for as STI breaks 2900? 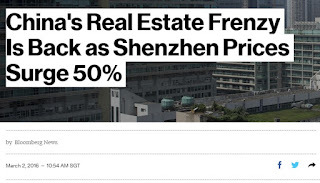 1) China Property Prices Rising Crazily! If you are looking for a property market that is vibrant, then the Chinese property market is one place you cannot miss. According to the latest data on house prices for March, the 100-cities index rose 7.4 percent year-on-year and 1.9 percent month-on-month, the strongest month-on-month increase in the index’s history. Last year, prices in Shenzhen went up 52%! 52% in one year is a crazy return for properties, anywhere in the world! Shanghai went up 18%, Beijing 10% last year. 2) Government Stimulus Measures is fuel to property prices and they aren’t finished yet! 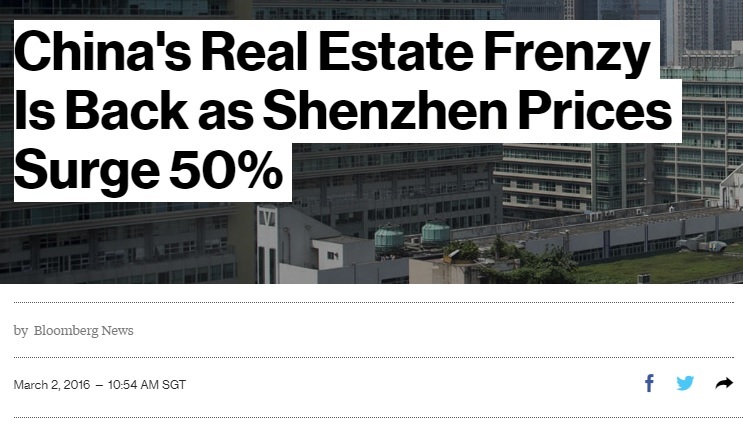 There are basically a few stimulus measures that China government are implementing that fuel the rise in property prices last year, especially in the first tier cities like Shenzhen, Shanghai and Beijing. Chinese government consistently print money to help the economy, which will benefit China property given the lack in confidence in stocks now. They are also decreasing interest rates and the bank reserve requirement. One of the key factors affecting the property market is the intervention from the local government through regulations. Tier 1 city governments recently have introduced measures to cool the property market. However Tier 2 and Tier 3 cities are having totally different policies. Local government in these cities instead are trying to stimulate the property prices and allow easy credit. And this can only mean one thing! Tier 2 and Tier 3 city property prices will start to get red hot soon! Property investors who make his money in tier 1 city might start to look at tier 2 and 3 which have not run yet. Property Developers who are already in Tier 2 and Tier 3 city will benefit. 2) What are the recommended Singapore listed China-property stocks to look at for 2016? 3) What are the indirectly-related stocks or index to look at when China property price surge? 4) Is China economy and stock market at its Bottom? 5) How do you make money consistently from the stock market every month? What are the Singapore Stocks that show Big Players Now? Post Brexit, Singapore Stock market has gone crazy, rising 140 points in just 3 short days. All Bad news has priced in! It is time to pick up some stocks that have shown great momentum, stocks which show Big Players are buying. Recently stocks like Japfa and CNMC Goldmine has been terrific and driven by lots of buying. This run did not occur because of retailers buying. BIG Players are in these stocks! Come and Join Mr Andy Yew, Singapore's top notch popular remisier to find out what are the Singapore Stocks that show Big Players! ✔ What are the Recent Singapore stocks that show Big Players Now?